BP-7.2-2000 : 7.2 volt 2000mAH NiMH battery for emergency lighting (Ademco, Lynx, Honeywell). Fits/replaces Ademco K5109, Lynx, WALYNX-RCHB-SC, Honeywell K10145X10, Interstate 1247. 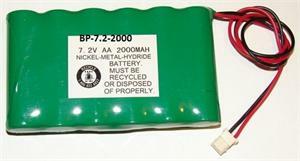 These battery packs are manufactured in the USA by BATTERIES AMERICA.